Debt agreements still popular but will this last? In May, the Australian Financial Security Authority released the personal insolvency statistics for the first quarter of 2018. It recorded 7,910 personal insolvencies, showing a modest 0.1% increase on the 2017 March quarter and a 4.3% increase on the December 2017 quarter. 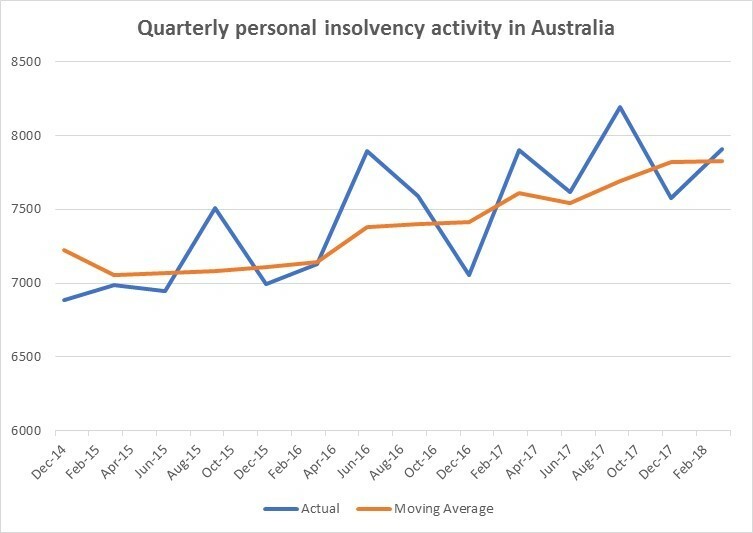 This continued the trend of steady overall growth in personal insolvencies in Australia which has been ongoing since June 2015. After experiencing two quarters of growth, bankruptcies returned to the long-term trend of a steady decline as alternatives to bankruptcy seem to maintain their appeal with debtors. Debt agreements continued in their growth and in the March 2018 quarter comprise 47.1% of all personal insolvencies, up from 45.4% in the March quarter 2017. Debt agreements also registered a record quarterly high in New South Wales in March 2018. Personal Insolvency Agreements (PIAs) recorded their lowest quarter on record, with only 37 in the March quarter 2018. This is the first fall in PIAs since the March quarter of 2016, when the previous low of 38 was recorded. In the March quarter 2018, 16.1% of personal insolvencies were business-related, a reduction from the 18% average in the 2017 calendar year. Consumer credit issues, in particular loss of income, unemployment, and excessive use of credit have increasingly become the main reasons for personal insolvency in Australia and this trend appears to be continuing in 2018. It looks likely that the term of bankruptcy will be reduced from three years to one year, with the amendment recommended to the Senate in April 2018. The shortening of the term of bankruptcy could significantly impact the current popularity of debt agreements. A one-year bankruptcy may be far more appealing to consumer creditors, who make up the majority of personal insolvencies in Australia. Brendan joined the firm in June 2013 and brings with him over nine years of specialist insolvency experience in both the corporate and bankruptcy spaces. He graduated from the University of Newcastle with a Bachelor of Commerce and is a member of Chartered Accountants Australia and New Zealand.